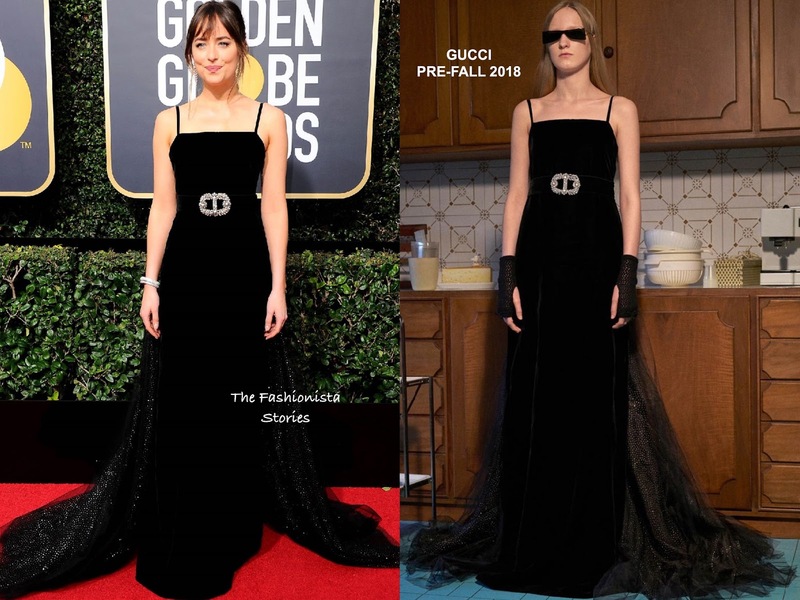 On hand as a presenter, Dakota Johnson hit the red carpet this evening(January 7th) for the 75th Golden Globe Awards at The Beverly Hilton in Beverly Hills, CA. Turning to go to designer brand, she wore a GUCCI PRE-FALL 2018 black velvet gown with a statement buckle belt and a shimmery embellished, layered train in the back. The detailed train in the back is what makes this gown. Adding some extra sparkle to her look, she accessorized with sparkly diamond earrings & bracelets which topped off her look along with a ponytail with bangs.